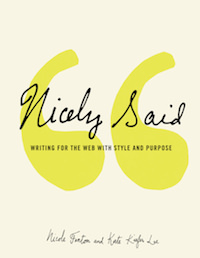 Nicely Said: Writing for the Web with Style and Purpose is a new book from Nicole Fenton and Kate Kiefer Lee. Here are some ideas for your style guide. For more details, refer to Chapter 12: Style Guides and the index in the back of the book.